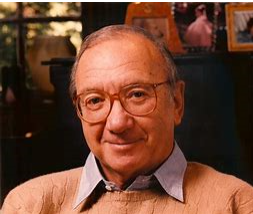 I did not know Neil Simon personally. But growing up in the theater in the decades where he dominated the Great White Way, his work was overwhelming to a young playwright, me. At one time, he seemed to have every play on Broadway. The Christmas after my mother died, I was feeling particularly bereft and found myself observing a great Broadway tradition. I went to Chicago. By train. To see the out-of-town try-outs for a musical version, of a movie he wrote “The Goodbye Girl.” Seeing that only half-successful work in the middle of the cold Chicago winter made me realize that yes, all your idols have feet of clay. IOW, everyone makes mistakes. The Goodbye Girl was a musical with a book by Neil Simon, lyrics by David Zippel, and music by Marvin Hamlisch, based on Simon’s original screenplay for the 1977 film of the same name. I was also at a rehearsal of “The Goodbye Girl” when it limped to New York, and in the rehearsal room were the star Bernadette Peters and yes, Neil Simon himself. He seemed so un-prepossessing in person. He was wearing a robin’s egg blue sweater and kibitzed around with the various actors….But it was his eyes that got me. The intensity of his stare. Nothing was being missed. He saw it warts and all and I’m sure was thinking “How can I fix this? How can I help?” He reminded me of a very warm and friendly rabbi. His vast knowledge of the theater seemed to match those of a rabbinical scholar. He seemed immediately nice. But also intimidating. I mean, he was NEIL SIMON! But he didn’t carry himself like a star as Ms. Peters certainly did. I guess I was so intimidated by him, I didn’t even have the chutzpah to talk to him. But what could I have said? “I saw your play in Chicago and really liked it.” God! I hope didn’t say THAT! Which would have been a complete lie. I don’t think I did. I never saw him again. And, the show flopped. I thought nothing he wrote could ever flop, but some did. 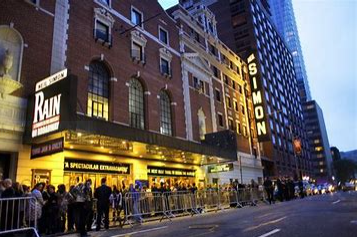 He strangely isn’t revived much of late, but the Neil Simon Theater is still there. A permanent and fitting monument to a man that made Broadway history over and over again. He will be missed by all in the theater community. It was his great love.